Gift of love is one of the new Hostess sets. It's a two step stamping set with a beautiful flower and some really useful greetings in a beautiful font. This is a Basic Gray card layered with Peakaboo Peach (one of the new In Colours), some more Basic Gray, then Cucumber Crush with a piece of Affectionately Yours DSP. 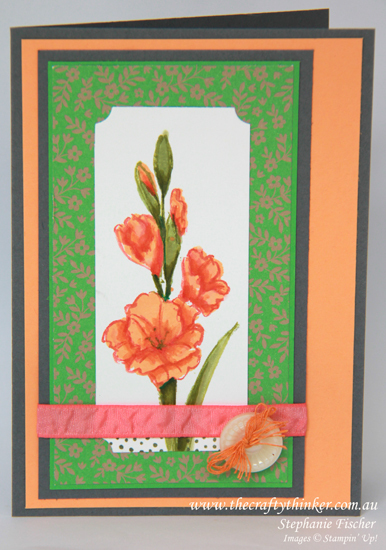 For the flower, I stamped the leaves first using Pear Pizzazz ink on Whisper White cardstock, then added some shading with a variety of green Stampin' Write markers until I was satisfied with the effect. I then stamped the flowers with Peakaboo Peach and Flirty Flamingo (another new In Colour) then shaded with matching Stampin' Write Markers. I masked the stem and leaf then stamped some dots in Old Olive ink with one of the stamps in the Perfectly Wrapped set (although not much of it showed in the end!). I trimmed the corners of my flower panel by cutting each corner separately with one of the dies from the Tags & Labels framelits set. I wrapped a piece of the new Flirty Flamingo Ruched Ribbon around the panel then stuck the panel to the front of the card. I dyed a length of Whisper White Solid Baker's Twine Peakaboo Peach (by soaking it in a few drops of ink refill with a little water in a plastic container) and threaded it through a large Classy Designer Button before using a dimensional to attach the button to the card.